As a way to both look back at a great minor league season and celebrate the release of the 2019 Twins Prospect Handbook, I’m shining the spotlight on a few players in the system. Next up is Lewis Thorpe. In the first installment of this series, we took a look at right-handed pitcher Jhoan Duran and I shared some video of a brilliant start he made for Cedar Rapids. More recently, I took a look at Alex Kirilloff, an excellent hitter who is also a better athlete than he often gets credit for. Let's shine the spotlight on the Thorpedo. Thorpe had a huge 2018 season. He was placed on the 40-man roster, made his Triple-A debut and was named the Jim Rantz Twins Minor League Pitcher of the Year. Speaking of that Triple-A debut, let's take take a look back at that outing. How about that for an arrival? Thorpe threw 71 of his 100 pitches for strikes, getting 22 swinging strikes. He struck out nine batters without issuing a single walk. 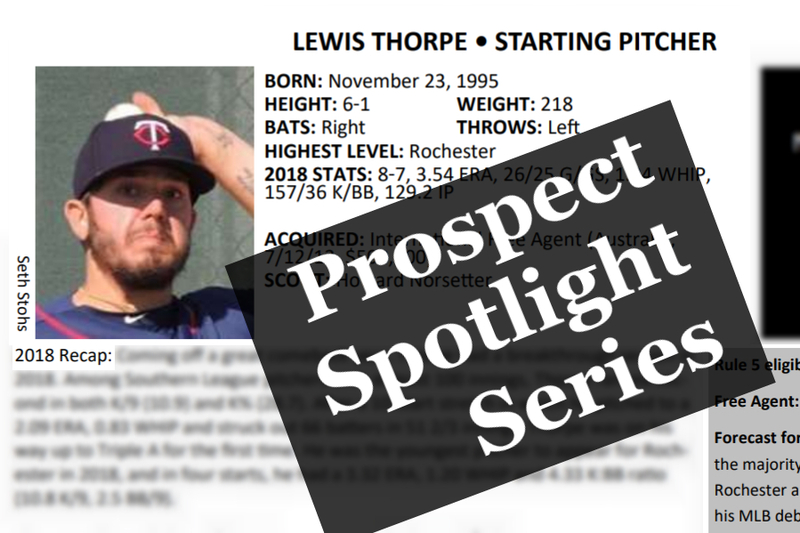 Thorpe made three more appearances with Rochester prior to the end of the season and finished with a 3.32 ERA, 1.20 WHIP and 10.8 K/9 in 21 2/3 innings with the Red Wings. Thorpe is just one of more than 160 players featured in the Prospect Handbook.We had a ton of fun putting the book together and we’re really excited for people to read it. Recognizing these minor league players for their efforts and ability is a big motivating factor in the project, so we would love for you to pick up a copy. Twins aren’t lucky he didn’t get taken in the rule 5 last year. He was a year ago, I believe, which is what I meant. Which, technically, was the year before last, not last year, now that we are in 2019. Its really nice that you clarified that. I think. Nope, Thorpe was protected a year ago. He's been on the 40 man roster since 11/20/2017. Have followed this kid since he was lights out in the Australian Winter League back in 2013-2014.He was turning 18 and in a league with a mix of everything from guys with a cup of coffee to a lot of A and Hi-A ballplayers.If memory serves, he had the second best ERA in the league up until one of his last starts. I know most feel that Thorpe doesn't have the stuff to be a front of the rotation starter.After missing two entire years of development, I agree he needs both experience and work on a couple aspects of his game. I see Thorpe as a pitcher who does have what it takes to make the next start every game after Berrios.Is that as an number one, with Berrios as an ACE, or number two?Only time will tell, but I have 100% confidence this kid is going to get there and be part of that young rotation that the Twins will win with as we enter the next decade. I'm excited about this guy, and hopeful he has another year of good health, because it feels like injury is the only thing that will derail him making his MLB debut in 2019. After missing 2 whole seasons (consecutively, on top of it!) he's finally healthy and pitching well. He's going to need to get deeper into games, so finishing off hitters efficiently is going to have to be part of what he works on in AAA, but the peripherals look great. When healthy, he's been lights out while being very young for his league. I haven't seen him pitch, but I have a tough time believing he couldn't be a very good major league pitcher. He's one of the guys I expect to see in the rotation at some point this year, and I think he's one of those guys who may stay when he gets there. He wasn't protected in November of 2016 though. I believe he was eligible and since he had just had Tommy John surgery, he went unselected. Thorpe is one of the reasons I'm not overly concerned we appear to have glowing holes in the 2020 rotation. TR always said you send the best 5 out there, whatever hand they throw with. I like having a lefty. I think people are doubting his stuff. He has always been better at missing bats than the guy who gets credit for having the big "stuff," Fernando Romero, and is also a year younger. Thorpe would be the top lefty starting prospect in the system for me, and I can't say I wouldn't put him in front of Romero if he was still eligible. Reason being is the RP risk we're seeing going around now, has always been there on Romero for me. And I'd also say that risk has always been considerably higher for him than Thorpe to me. Ah ha, I’m not totally crazy. Just off by a year. A team would have had to have serious long-term planning, though, to selected Thorpe two years ago, keep him rostered for a year, and send him down. It worked for the Twins with Pressley, I suppose. Anyway, glad the Twins have Thorpe. Can we move on to discussing his “Thorpedo” pitch? Maybe I'm just an optimist and like a good story, but Thorpe is one of my favorite stories, and borderline untouchable. He put up good numbers initially, then missed two full seasons due to injury and illness. Despite that, he has come back seemingly as strong as ever, and finished last year at AAA with a handful of solid performances. Despite missing those two full years he will only be 23-24yo at Rochester next year. He's a LH who brings it consistently 91-94. You can see his potential in the video Tom shared along with his numbers. I don't knkw if his ceiling is a #2 or #3, but I think he will be a fixture come 2020. I don't wish bad health or poor performance on any of our currently projected SP, but between him, Mejia, Romero, Gonsalves, Berrios and others on hand, I'm really hopeful for a crowded rotation come the second half of 2019. I like that he's already been tested an shown the ability to overcome adversity. Oh, and his pitching stuff. If anything I think Thorpe is a bit underrated. He’s got a good enough fastball, but what makes Thorpe a better prospect than many believe is 1.his secondary stuff is real good (change, curve, and slider), and 2.he has very good control and has vastly improved his command of his 4 pitches. Also what I loved (even though his w-l record wasn’t great) was that even through nearly 130 innings (previous high in IP was 83) Thorpe still looked fresh. He may not be an ace, but I don’t think it isn’t crazy to think he may be a #2-3. I don't care about mythical aces, ace is a very overused term. My hope is Thorpe fills the middle of the rotation starting in 2020. Finally we have 3 lefties, Gonsalves, Mejia, and Thorpe, vying for spots. Pitching is a numbers games, percentages are on our side. I think Thorpe will be a better player than most people think.He's one to watch this year. It'd be nice if Thorpe could crack the rotation at some point in the season and try to buck the trend of awful rookie seasons for starting pitchers in recent Twins history. If all goes well I think he can be a #3 pitcher, but perhaps #4 is a safer bet to make. I remain a big believer in Thorpe too. I've never seen him pitch but everything I read about him causes me to take notice. I'm hoping he will make his MLB debut with the Twins this coming season. Yeah, that may be wishful thinking, but I think he has the tools and the confidence to make an impact ASAP. Thorpe is intriguing talent to say the least. I hope he debuts this season but that might be a bit agressive. I think he debuts this season, at the latest by September if he isn't hurt or tanking in AAA. It'd be aggressive to say that'll he'll stick in the rotation after his first call-up. Hope your right I am encouraged by his progress.